I want to share my experience in using GAPS for recovery from long-standing health issues I experienced for over 20 years of my life: insomnia, panic and anxiety. GAPS is a healing protocol developed by Dr. Natasha Campbell McBride to correct digestive compromise and nutritional deficiencies in the body as a result of poor lifestyle and dietary habits. Dr. McBride’s groundbreaking book, Gut and Psychology Syndrome is one I highly recommend everyone and anyone read, via my Amazon affiliation. I think they say something significant about how we view health: That our focus is not on finding the cause, but dependence upon chemicals to suppress symptoms. I believe it also shows something else: Those medications aren’t curing symptoms, they are simply managing them. I would guess those numbers may be inaccurate, and are low due to the fact that not all incidences are reported. I never wanted to rely on drugs for anxiety, or any other health issue. But at least a few times before I resolved my issues with food, I became desperate and took them. What I learned was that those drugs didn’t solve the actual cause of the problem. In fact, my situation only became more dire while taking those medications. Prior to starting GAPS, our family was experiencing a great deal of stress and I was working long hours without taking breaks in front of the computer. Initially, I didn’t believe I needed GAPS because in theory, my diet was very healthy. After all, I had removed processed foods years before and was eating a variety of real foods, so how could I possibly need it? By April 2011, I decided to it was time to try this protocol since I had not been sleeping for over 3 months. During that time, I experienced some of the most acute insomnia, panic and anxiety symptoms I’ve ever had. It is not an exaggeration to say that my level of sanity during those preceding months was very much on the edge, and I was a complete wreck. On many days my head was full of thoughts of ending my own life. I was desperate and tried everything I could to bring myself relief from racing heart, constant jitters or feeling of internal shaking, extreme fatigue, constant thoughts of doom and sadness, diarrhea, chills, and difficulty breathing. I consulted with many different holistic-minded individuals and practitioners, and received a lot of different opinions. One person told me I was suffering from heavy metal issues, another from thyroid problems. I was told by yet another that I wasn’t absorbing the nutrients from the foods I was eating. I also had some long-distance and online conversations with a few friends to whom I am forever grateful for their balanced advice and suggestions. I so appreciate those who reached out to help during that time, and especially to those who reinforced what I already knew: that there was very likely some truth to all of the diagnoses I received, but that most importantly, I could use food to heal myself and eliminate most, if not all, of the supplements I relied upon. Although I had eliminated processed foods and was eating real foods each and every day, what I hadn’t taken into account was that for years prior to this episode, our family had been under a tremendous amount of stress. That stress had a profound effect on my health. In 2009, my husband was laid off from his programming job and we decided to use our retirement savings to open a solar business. The business was my husband’s dream, and we both really wanted it to succeed. As anyone knows who has started a business from the ground up, the process of getting that business off the ground is no small task. Our situation was complicated by challenges including online theft and fraud, and a breach of contract when our business partners abruptly dissolved our contract with no communication before, during or after the event about responsibilities. Throughout my life I have dealt with chronic insomnia and panic. I spent years in my teens, 20s and 30s seeking the advice of conventional doctors who told me “nothing was wrong”. Even though “nothing was wrong”, I was frequently recommended to take anti-anxiety medication. The idea of prescription medication always terrified me because I worried about becoming dependent, side effects … and my biggest fear was that ultimately, the cause of the problem would remain unsolved. I would later discover that these were signs of underlying overall health issues. When combined with stress and not getting the nutrients I needed in the proper amounts and correct form, my body began to tell me something was wrong. I was trying to listen, but I wasn’t understanding the language my body was using. After 3 months of effort, no holistic practitioners I consulted were able to help. Within 5 days of starting GAPS, I was getting more sleep than I had in months. Within about 6 weeks, I was sleeping through the night again, uninterrupted. I’ve never had such noticeable and dramatic results with any other effort or protocol I’ve ever done. Since most people have digestive issues, I believe this is a major culprit of many health issues. If we can’t digest the food we eat – even if it is real, healthy food – this presents a challenge in overcoming health problems since we need the nutrients in those foods to heal our bodies. GAPS addresses those issues by providing the most nutrient-dense foods in the easiest-to-digest forms. It has become very clear to me that the answer for health problems is not in supplements – and certainly not medications – but in a real food diet, stress management, getting out in the sunshine, adequate rest and relaxation. I truly believe now that nothing we experience is ever caused by just one factor, but many different things going on around us. I’ve also learned that we cannot underestimate the effect stress has on our bodies. My results on GAPS enabled me to overcome chronic health issues including panic, anxiety and insomnia which controlled my life for over 20 years. Never again will I doubt the power of healing foods and recognizing when stress has done damage. I took supplements for many years, believing these were the answer to my problems. However, supplements are difficult to absorb as they often contain synthetic nutrients, or those that are not in the most bio-available form. Many products also contain fillers and other ingredients that can be toxic. I’m not saying all supplements are harmful, but if you use them, be very certain that you actually need what you take, and that you are eating the healthiest diet possible. Sometimes even with a healthy diet, because of pre-existing health issues, the possibility of mineral depletion from our soils due to a predominance of chemical farming, and pollutants in the environment and food, even this might not solve the problem. Based on my body’s response to the GAPS Diet, I realized I was depleted in the nutrients found in these foods. I also realized the supplements I had taken for years may not have been doing what I needed. Dr. McBride talks about taking supplements as close to real food as possible, and in liquid form as one of the best choices for absorption. Liquid nutrients from real food can be absorbed easier, and the foods included on the GAPS diet: fresh-pressed juices, broths, soups, stews, cultured dairy foods, and fermented vegetable juices fit that description. Many products claim to be potent, safe, easy to absorb, and high quality. From my research and experience, reliance upon supplements rather than food may not solve underlying nutritional deficiencies on its own, can be a source of liver toxicity, and can make matters worse by contributing to the body’s overall toxic load. I believe this is why GAPS works for many individuals, and why it worked for me: the diet provides necessary nutrients needed by the body, and in the most digestible format possible: through broths, fermented foods and beverages, juicing, healthy fats, and well-cooked vegetables and meats. GAPS may not be the answer for everyone, but it worked for me. I was asked to do an interview with my friend Kim Metez who was the producer of a weekly show called Chew On This, featured on Radio Boise, a local, independent radio station. Our interview focuses on the importance of real food with an emphasis on how the work of Dr. Weston A. Price revealed the impact of traditional diets eaten by isolated populations of people all over the world, as well as the GAPS diet. I also did an interview with Starlene Stewart of GAPS Diet Journey. Listen to this conversation here. I can say with absolute certainty that GAPS is effective for more than just digestive issues, food allergies, chronic infections, skin problems, and fatigue. Just as the name implies – Gut and Psychology Syndrome – this protocol really can get to the root of so-called “psychological”, “anxiety”, and “emotional” issues. Dr. McBride talks in detail about how the GAPS syndrome encompasses conditions such as depression, hyperactivity, ADD, and even schizophrenia. From my own experience, it makes perfect sense that it would be useful for those suffering with insomnia, panic, and anxiety, and related issues as well. Have you experienced panic, anxiety, or insomnia? What steps did you take to address them? So what exactly is GAPS!!!! I can’t find it in this post??? The basic premise of GAPS is to heal and seal the gut by eliminating grains, starches, and sugars and including nutrient-dense foods such as broth or meat stock made from the bones of animals, fish, and birds, fermented foods such as sauerkraut and beet kvass, and traditional fats such as lard, tallow, chicken fat, goose and duck fat, and others including coconut oil and olive oil. Although I don’t mind providing those explanations, the purpose of this article was to share the story of how I recovered from anxiety, panic, and insomnia with GAPS, not to go into great detail about how the protocol works. There are links to the book and the web site provided throughout the article for this purpose. Thanks so much for sharing this. 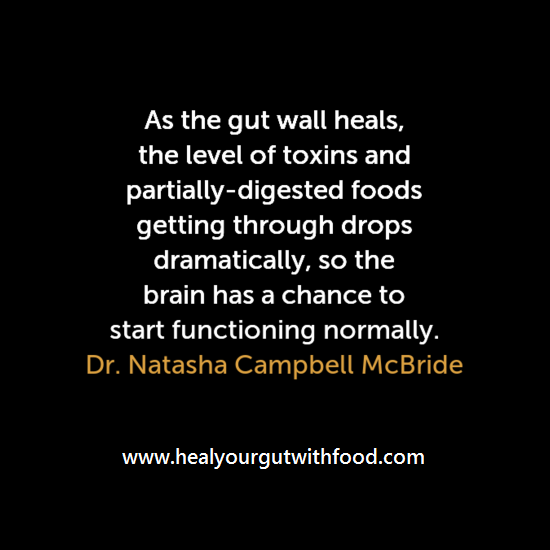 Real food is wonderful, but sometimes we really need a gut healing diet like GAPS to make the difference in our health. Love learning from your journey. Hi Emily – thank you for your comment! I love how we all learn from each other. It’s such a blessing to have this information to share with others! I LOVE posts like this so people can see how the gut is your second brain. It is so key to being healthy and functioning. Great post, Raine. Hi Jessica – thanks for your comment! Yes, our gut is our second brain, and I think this is illustrated so well in seeing issues like anxiety, depression, insomnia, and panic resolved with diet. Dr. McBride talks about others in her book, I really believe these are all connected and have the same cause. Oh, so happy and thankful for what you’ve accomplished with and through GAPS. So sorry for your many years of grief and pain. Hugs to you and AMEN for your healing. Thanks for sharing this. May it help many others find the light at the end of the tunnel!! Thank you for sharing! I love reading about other people’s experiences with GAPS. I’m so glad it has helped you so much. I sleep much better since embracing a real food diet. I no longer eat after dinner which has helped a great deal. Sunshine and outdoor time during the day has also been huge in improving my sleep. Hi Andrea – thank you for your testimonial about how real food has helped you sleep better. And it’s true that something different works for everyone. I’m glad you are realizing the benefits of sunshine and being outdoors too. That has also been a huge benefit for me and I find that when I don’t get sunshine I actually sleep less well. I never feel like I am wasting my efforts eating real food as I always reap the benefits. Thank you so much for this! It has given me hope that I can be healed, I have been on sleep meds every night for over 13 years and am terrified of not having them which tells me I am most certainly addicted 🙁 I have been trying to research on how to get off of them and am thinking that the GAPS diet is a very good place to start. Hi Dona – I am so glad you found this article I wrote. I have been really hoping that my experience would reach those who have suffered from chronic insomnia, panic, and related brain and nervous system disorders. I would love to hear about your experience and progress as you go along. Please feel free to post here or on my Facebook page. Raine – how long did you do the GAPS protocol for? I have sleep apnea and wonder if it would help that. Hi Nancy – I started in May of 2011 and stopped in the early spring of 2013. Although my husband has not done GAPS, he’s had sleep apnea as well and has had some success in our regular diet which does include traditional foods, fermented foods, and broths daily. I do think a concerted effort like GAPS would be beneficial too. Hello Lonnie – sorry for the delay in my response. I do think GAPS is a great way to overcome anxiety, and many people have had success with it. The reason why I say this is because our brains need nutrition and without it, much can go wrong. We have a need for fat and the nutrients found in foods that have fat in them. Pastured animal foods and easy-to-digest foods such as broth and fermented foods can heal and repair the gut and also provide essential nutrients for our brains and nervous systems, and our whole bodies. Medication is really just a band-aid and not something that can ever “cure” or get at the root of the problems in our health conditions. Even if you don’t participate in GAPS 100%, you can still see some tremendous benefit. I was unable to do my protocol 100%, as most people do have some challenges. I’ve only known one person who claimed to be able to do it 100% and she needed something else, so she moved on to another regimen. The key is to reduce or eliminate sugar, starches and grains as much as possible while healing and including organic, real, whole pastured animal foods. Some people are sensitive to dairy, which is why cultured dairy foods are beneficial. Sometimes those have to wait until some healing is done. When healing has occurred, you can gradually start adding foods back in that have been avoided, but only in their traditional, real, organic forms (grains and starches, and of course, dairy foods). I don’t think you would need a specialist to get started, because there are so many resources online. Healing our bodies is often a matter of listening to our bodies. Sometimes a practitioner is necessary, but they can only give you so much in the way of support as they sometimes have limited understanding of a particular issue and aren’t the person who is experiencing the symptoms, which is really a big part of healing ourselves. I wish you and your daughter the best and please let me know if I can be of further assistance.